110 MMS October 2017 mmsonline.com BETTER PRODUCTION Shops Using Technology exchange products using two punch presses and a simple CAM system. However, it became apparent around 2010 that the software was too simple. According to Jon Yeomanson, drawing office manager, the interface was out of date. "It was ver y poor and still appeared to be DOS- based, even in 2010," he says. Even more con- cerning was the sof tware's lack of automatic nesting capability. "I had to employ someone all day literally to play Tetris, to lay up nests, which is a mundane and boring job for a relatively highly paid member of staff," he says. The company was also unsatisfied with the suppor t it was receiving from the developer. Mr. Yeomason says that questions were of ten n ot a n swe re d, a n d th e s of t wa re wa s n eve r updated, despite the fact that his company paid for maintenance. 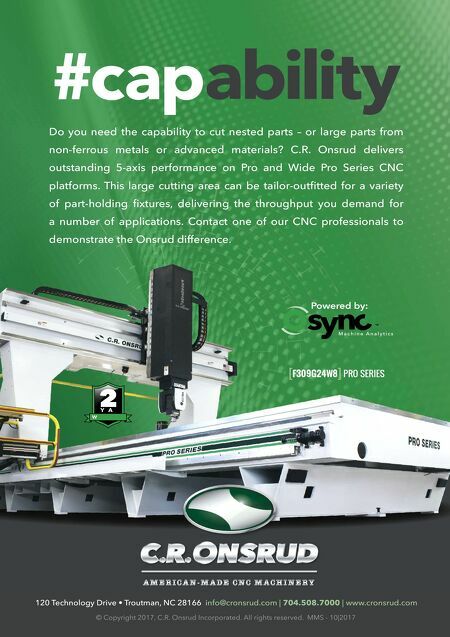 At first, new software was not on the company's r a d a r. O n l y a f t e r i t started looking at new punching machines did it make this consider- a t i o n. O n e p u n c h i n g machine ve ndor pro - vided a nesting software HC COILS LTD. PROBLEM CAM system did not have automatic nesting capability SOLUTION Jetcam Expert Premium CAD/ CAM software with free-form nesting RESULTS Programming time reduced by 85 percent Nesting Software Reduces Manufacturer's Programming Time S hop employees' time is valuable, so products that free them from unnecessar y or time- consuming tasks would seem to be a good invest- ment. 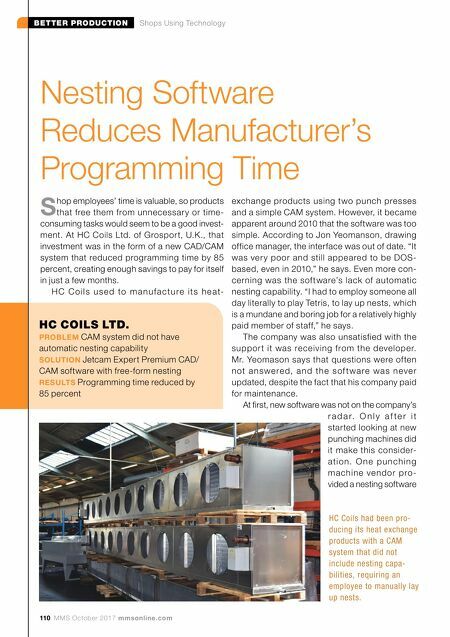 At HC Coils Ltd. of Grospor t, U.K., that investment was in the form of a new CAD/CAM system that reduced programming time by 85 percent, creating enough savings to pay for itself in just a few months. H C C o i l s u s e d to m a n u f a c t u r e i t s h e a t- HC Coils had been pro- ducing its heat exchange products with a CAM system that did not include nesting capa- bilities, requiring an employee to manually lay up nests.